All businesses of all sizes need a cleaning team for their premise. When a premise looks dirty clients will be anything other than impressed when they visit you. But let’s say that your business is not just an office block but includes a whole building with some grounds and outbuildings. Here you will need both the interior and exterior cleaning as well as the paintwork upkeeping. The perfect job for commercial janitorial cleaning solutions teams in Bristol. What you need for this type of a premise is a janitor and a cleaner. But when you employ both you will have two bills to pay at the end of the month. Also you won’t ever be entirely sure where one job description ends and the next one starts. This is why you should employ just one cleaning company for your commercial janitorial cleaning solutions. With the equipment necessary for both sides of the job, you will keep your monthly cleaning bill down to a minimum. So let’s take a look at what jobs your Bristol commercial cleaning team should be responsible for. The areas inside your build that need cleaning won’t really vary much from one business to the next. Your floors should be kept cleaned, as should your furniture and windows. Carpets should be deep cleaned at least once every six months, as should any upholstery you have. Dusting on a daily basis will keep your build free from dust and keep the air fresh to breathe. Communal areas should also be included on your cleaning rota. These include the staff kitchen and bathrooms and your public bathrooms. Lastly your entrance foyer should be impeccable at all times. This is the first place your visitors will see. Now let’s take a look outside, to areas that you would normally employ a janitor for. In fact, let’s take the example of a school building rather than an office block. A school will always employ a janitor and a cleaning team. Once again, this is false economy as one team can do all the work. But let’s take a look at the type of jobs your janitor would do. He would rake the gravel paths, remove leaves, pick up litter, and touch up on paintwork. Graffiti removal would be another of his tasks, as would trimming the lawn. So, if your office is in a more traditional setting you too will have all these areas that need keeping clean. Your driveway should be clean and tidy and when it has gravel it should be raked often. Leaves should be cleaned from the ground and from the gutters and trees and bushes should be trimmed too. Paintwork should be touched up on wooden windows as well as on your exterior walls. 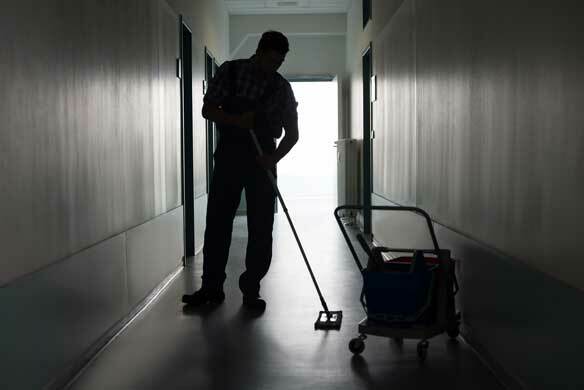 A janitorial cleaning service can provide you with a two-in-one option that is perfect for all your cleaning needs. Remember that it is not just the interior of your build that needs to look its best. Your clients will see the outside of your premise first, and that first impression is the one that really counts.